Famine is man-made, a solution is up to you. Home→Blog→activism→Famine is Man-made, a Solution is up to You. ← I’m an idealist. I don’t know where I’m going, but I’m on my way. There are currently 13.3 million people in crisis in the Horn of Africa due to famine. Yes, there is still a famine affecting men, women, and children in ways that are unimaginable to most of us in this part of the world. I realize there are other issues, but this. this is something that is an indicator of what is wrong with our global society. In Africa, nearly 2/3 of the population is involved in farming, which accounts for around 1/3 of GDP. Agricultural growth is 2-4 times as effective at reducing poverty as growth in other economic sectors. Helping women farmers as much as men could lead to a 15% decrease in hunger around the world. One dollar spent on agriculture leads to a savings of at least $10 in humanitarian aid the next year. I heard today from a friend that is working at the environmental education center and farm that is part of our school district (yes, how lucky that we have this available to us) that every day our schools are throwing away about 50 lunches. That is sickening to me when I think of the hungry children here in our own community and infuriates me when I think of the people starving in the Horn of Africa. The people who are working on the ground to make a difference with the people in crisis all say the same thing: the key to long-term success in Africa is to invest in agricultural development. This includes improving the water and sanitation, working with farmers to make the most of their land and use sustainable techniques, and providing seeds and livestock to those that need it. They are also in desperate need of short-term emergency food, water, and medical supplies. How can you help? This is the perfect season to start thinking more carefully about what you can do to make an impact through this holiday season. Halloween: Buy fair trade chocolate. Buying chocolate from companies, like the largest Nestlé, supports horrific human rights’ abuses, including child labor and slave labor in Africa. Buying Halloween candy and imagining a child beaten, starved, and forced to work to produce it may be hard to comprehend, but please try. There are so many other options. Thanksgiving and Gift-Giving Holidays: Giving thanks for what we have might include helping those that are less fortunate than ourselves. I believe that giving thanks does not have to wait for a special day, but can be celebrated anytime anywhere. Giving gifts that help others in return have become a new favorite in our house. Hopefully they can be in yours as well. 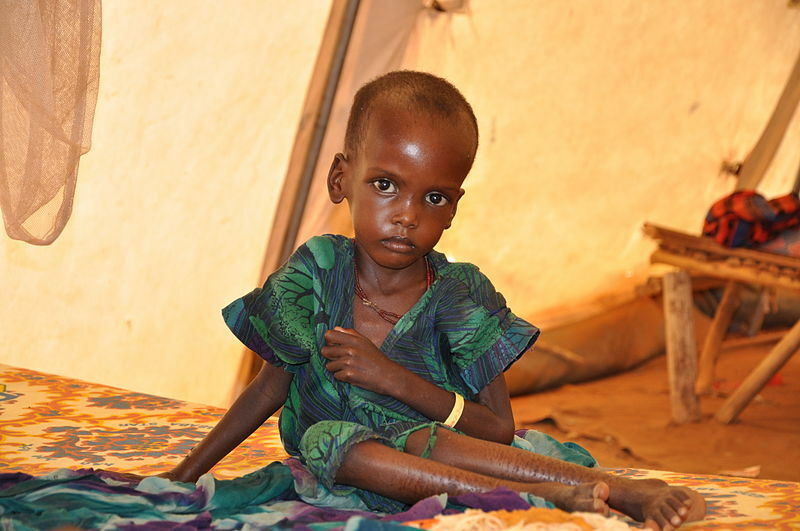 Want to help someone who is on the brink of starvation in Africa? A malnourished child in an Medicins Sans Frontieres (Doctors Without Borders) treatment tent in the Dolo Ado camp, near Ethiopia’s border with Somalia. ONE is asking you to take action now! ONE believes that to fight the famine, we need to feed the future. ONE is supporting Feed the Future, the U.S. government global hunger and food security initiative. A focus of Feed the Future is to reduce poverty and undernutrition. The U.S. is providing longer term development assistance through Feed the Future, which will increase resilience among vulnerable populations by increasing the accessibility of staple foods, reducing trade and transport barriers, harnessing science and technology to assist populations in adapting to increasingly erratic weather patterns, and supporting efforts to reduce marginalization of certain populations. World Vision is asking you to take action now! World Vision is a humanitarian organization working in nearly 100 countries to help children, families, communities overcome the obstacles of poverty and social injustice. World Vision is on the ground thanks to donations, both big and small. This organization has wonderful options for gift giving through their Gift Catalog that will save lives in the short and long-term. Through this catalog, you can choose to support agriculture through donating animals, clean water, emergency aid, and so much more. Gift cards can be sent to loved ones to let them know how the gift of an animal, bed nets, or even a bicycle will make a difference in someone else’s life. You can also choose to receive a tangible gift through your donation to where it is most needed: fair trade coffee sets or a Thai turquoise bracelet are a constant reminder of the work that is saving lives around the world. World Vision was kind enough to send me a couple of the sample gifts and I would highly recommend them to anyone looking for a way to give twice. In the next 12 seconds, another hungry child will die. Is that overwhelming? Here is the thing though. By making a choice now, you can actually prevent that one. If you do that and you can get your friends, neighbors, and family to do the same – that is impactful. You can make a difference. I don’t care how little you can give, it will make a difference. I don’t care how corrupt the governments and military and rebels are, we have to try. There are organizations that are able to work with the locals to get aid where it needs to go. It is difficult and slow, but it is being done. I believe in that, because if I can’t, then what is there? I can make a difference. You can make a difference. The question is: will you? Those statistics are overwhelming to think about. I am surprised that we stopped hearing about the famine. I suppose I was hoping that things were getting better and relief aid was able to get through and take care of the people. I am definitely going to take a look at the World Vision catalog. What a great gift-giving idea. Thank you for writing about this urgent huger situation. The most tragic part is that global hunger is not about a lack of food. It’s a problem of distribution. But I like the way your framed this message as a call to action. We have to do whatever we can to try to help.